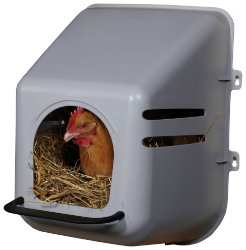 Provides a dry, clean and dark area for hens to lay eggs. Space-saving modular layout can mount vertically or side by side. Easy to mount and remove for cleaning. Mounts securely on wall with slide- type screw holes. Made of high-density, impact resistant polyethylene that is easy to keep clean and will not rust, rot, or corrode. Perch gives hens a place to land before entering nest. Perch is pre-installed and secured for shipping – simply flips down into place for use by the end customer. Compared to metal units this nesting box does not get as cold in winter months and is less expensive.